Aerolite 6R six piston radial mount front caliper kits add big brake stopping power and style to any 1997-2013 C5 or C6 Corvette front suspension. 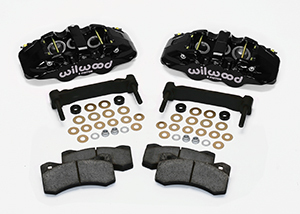 These kits replace the OE calipers on all models and mount in the stock caliper location. All the necessary hardware is included for correct mounting height and offset with the very affordable one-piece 13.38” Z51 style rotors. Aerolite 6R calipers incorporate race proven technology in a high strength forged triple bridge body design. They provide positive and confident pedal response that is matched to the OE master cylinder output and fully compatible with the ABS system. BP-20 dual-sport compound Smart Pads provide clean and quiet driving on the street, with improved friction and high temperature fade resistance for auto-cross and other sport driving applications.